Monday, June 25, 1888 still rather "pleasant & warm". All appear as well with our folks, & occupied much as usual, think, guess Charlotte's only "caller" was Bessie Howe with invite "coffee party" there tomorrow. Rosanna & the Boy's having returned from Frankville today. To Mr H- Pratts. Much as usual self, & guess spending day much same, & think without having to lose consciousness tho' realized some nervousness. 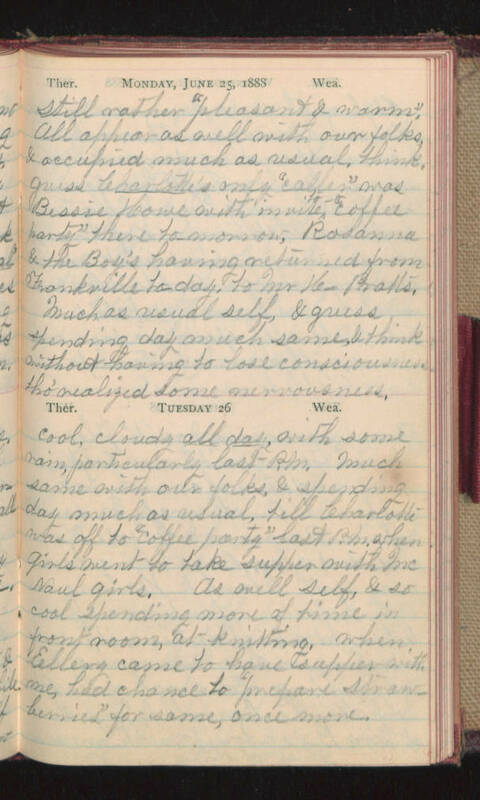 Tuesday 26 Cool, cloudy all day, with some rain, particularly last P.M. Much same with our folks, & spending day much as usual, till Charlotte was off to "coffee party" last P.M. when girls went to take supper with McNaul girls. As well self, & so cool spending more of time in front room, at knitting, when Ellery came to have supper with me, had chance to "prepare strawberries" for same, once more.